(Nanowerk News) Two high-speed electron microscopes. 7,062 brain slices. 21 million images. 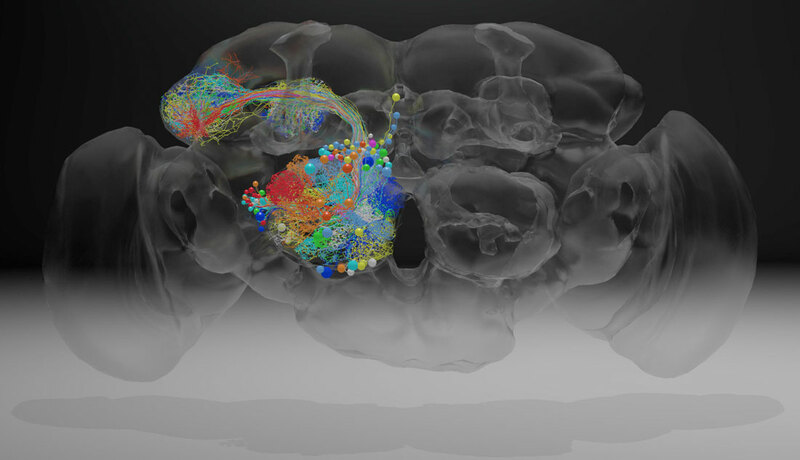 For a team of scientists at the Howard Hughes Medical Institute’s Janelia Research Campus in Ashburn, Virginia, these numbers add up to a technical first: a high-resolution digital snapshot of the adult fruit fly brain. Researchers can now trace the path of any one neuron to any other neuron throughout the whole brain, says neuroscientist Davi Bock, a group leader at Janelia who reported the work along with his colleagues on July 19, 2018, in the journal Cell ("A complete electron microscopy volume of the brain of adult Drosophila melanogaster"). Scientists can view these wires and synapses with an imaging technique called serial section transmission electron microscopy. First, they infuse the fly’s brain with a cocktail of heavy metals. These metals pack into cell membranes and synapses, ultimately marking the outlines of each neuron and its connections. Then the researchers hit slices of the brain with a beam of electrons, which passes through everything except the metal-loaded parts. “It’s the same way that x-rays go through your body except where they hit bone,” Bock explains. Synapses in Neuropil Compartments Innervated by MB-CP2. Using imaging data from a transmission electron microscope, scientists have reconstructed a subset of neurons in the female fly brain. The work revealed a new cell type (orange skeletons) that sends information to Kenyon cells in a memory center of the brain. Creating such cutting edge technology was no small feat, Bock says. The work required the collaboration of dozens of Janelia neuroscientists, mechanical engineers, and software developers, as well as engineering consultants and scientists at Johns Hopkins University and the MRC Laboratory of Molecular Biology. After a long informal collaboration between these scientists, a formal Janelia project team co-managed by Bock and Janelia software engineer Khaled Khairywas created in 2016 to push the effort to completion. Users can download the fly brain dataset at temca2data.org.